It's raining outside (cause). I used an umbrella. (effect). Cause and effect, particularly in upper elementary, is a text structure riddled with opportunity for our reading instruction. BUT we must be careful about whittling down cause and effect to only basic, isolated examples that ignore the complicated and nuanced reality of the concept, because if we do, we can quickly cover up a meaningful angle into understanding a text. Take the raining/umbrella example above. This morning, as my oldest daughter was walking out the door to her bus stop, I say, "Hey, it's raining. Why don't you get your umbrella out of your backpack?" She stands on the porch and claims it's not raining that hard. "I'll be fine," she says. I insist. "You have a soccer tournament this weekend. We don't need you getting sick." Daughter, with attitude, proceeds to take out umbrella, grumbling, "Dad, nobody else at the bus stop has an umbrella. I look like a dork." And she marches off. "I love you!" I call, imagining how forcefully she will jam that wet umbrella back into her backpack as soon as she's on the bus, getting folders wet, binders wet, books wet. Some things are caused by several other things, and sometimes one thing has several effects. And sometimes one thing causes another, which causes another, which causes another, which causes another. And sometimes one tiny thing can have an enormous effect. And often these causes and effects even overlap or branch out. By analyzing cause and effect in a text a little more deeply, we can really get into some of the most significant aspects of that text. 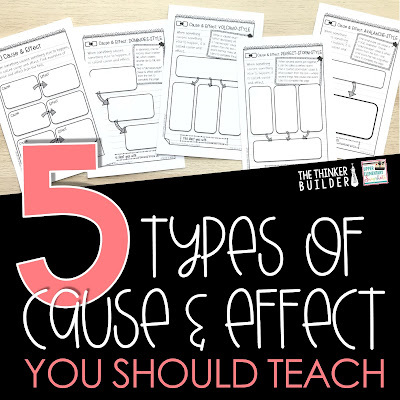 What follows is a framework of FIVE types of cause and effect to help students do just that. We definitely should not throw the simplest version of cause and effect out the window. It's the foundational block on which the other types build, after all. (Once you understand the other types, though, you'll start questioning whether or not any situation is simply a single cause with a single effect.) But hey, we have to start somewhere, and starting simple is always smart, especially to solidify the terminology of the words "cause" and "effect" to make sure everyone is speaking the same text structure language. So start with some simple, real-life examples... rain/umbrella, anyone? It may be review to some, and that's okay. In a text, pose questions like, "What caused such-and-such to happen?" and "What was the effect of so-and-so doing such-and-such?" In this type of cause/effect, an effect becomes the cause for another effect, which can then cause something else to happen, and so on. You know, like dominoes. Often a character in a text initiates a string of plot events with a key decision or action, setting into motion a domino-style cause/effect scenario. When working with a dominoes style of cause and effect, be careful not to attribute it to simply a series of events, because each event in a text isn't necessarily caused by the event preceding it. So it's important students are diligent in their analysis of the connection between each pair of events. The eruption of a volcano has many effects: trees and homes being destroyed, animals moving out, people evacuating, even weather patterns can be affected by the ash spewed forth. So in a volcano-style cause and effect scenario, one major cause has multiple effects. 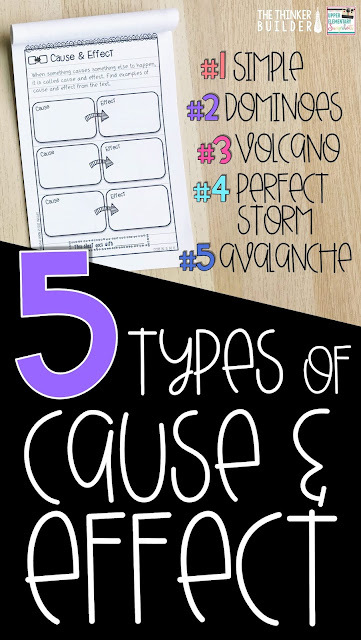 In reading, often a simple cause and effect can build into a volcano type when students look a little deeper at things less concrete, like feelings, decisions, and interactions. A perfect storm type of cause and effect is sort of like the opposite of the volcano type. At sea, when several storms merge together, sailors call the result a "perfect storm." 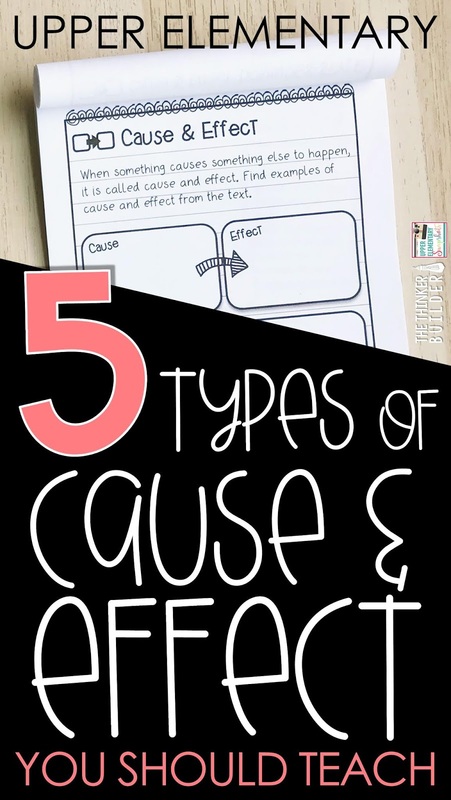 So in this type of cause and effect, we can identify multiple causes for the corresponding effect. In a text, this may play out in identifying all the factors that go into an important decision a character makes, or realizing how the author created two separate events that together, result in a subsequent event. An avalanche is often triggered by something very small, like a single skier at the top of mountain. But the effect (an avalanche) is enormous! In texts, avalanche-style cause and effects, in which something very significant is caused by something rather small, are often only ever noticed when we look back and reread. Authors like to drop bits of info here and there, knowing the reader won't recognize their significance until we read about the full effect later in the plot. 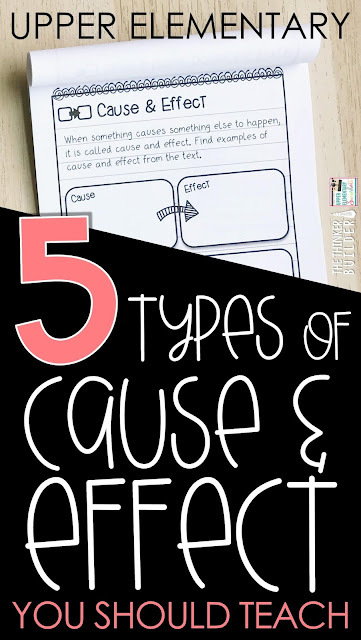 The notebook-style response pages shown above with each type of cause and effect help students organize and ground their thinking. 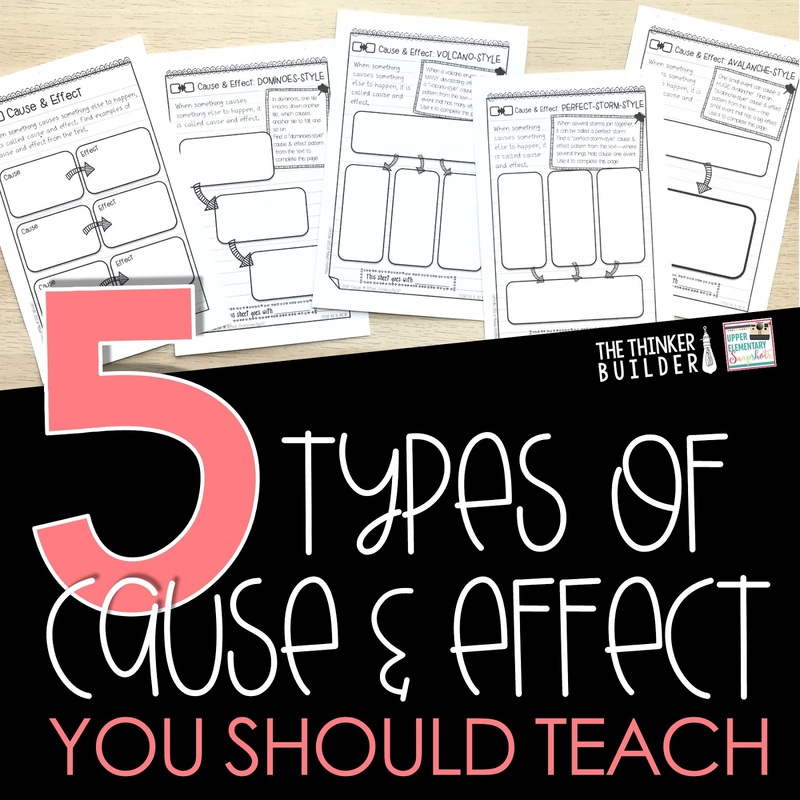 These graphic organizers are part of my huge bundle of Response Pages for Literature & Informational Text. They come in handy half-page sheets, they address an expansive amount of standards, AND they are differentiated to three levels. Click the image below for more details, or click here for the full-sheet version. Keep in mind, the five categories outlined above aren't always cut off from each other. More often than not, with careful reading, overlapping types of cause and effect can be teased out. For example, maybe several seemingly small incidents combine to have a very significant effect (Perfect Storm overlapping with Avalanche). Or maybe one event causes multiple things to happen, but each effect also triggers more decisions and events to happen (Volcano overlapping with Dominoes). Below is an amazing example to use with students for cause and effect. Even in the title of the video clip, "How Wolves Change Rivers," we are thrown into a conundrum... "Wait a second, how could wolves possibly change a river?" Through a series of cause and effects, however, we see the complicated yet fascinating path from a small group of wolves all the way to rivers that have changed course. If you view the video with students, see if they can identify any of the five types of cause and effect we talked about here, particularly Dominoes and Avalanche. What an engaging way to parallel the same things we're pushing them to do in the texts they read. 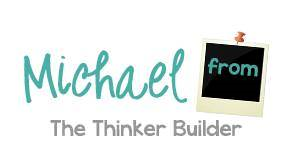 For more ideas and strategies focused on reading and writing, be sure to sign up for The Thinker Builder free email newsletter right HERE.